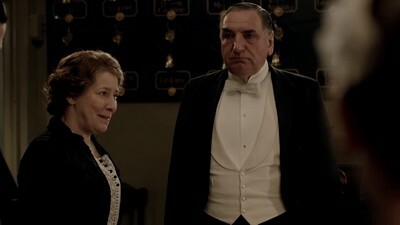 Another arrival is Cora’s (Elizabeth McGovern) American mother-in-law, Martha Levinson who wants to know why her late husband’s money is now Mr Crawley’s (Shirley Maclaine looking so old, her face a mass of wrinkles and too heavily made up); she in as more of the same. It’s a remark that could be found in Pride and Prejudice as Lord Grantham’s marrying Cora is a take-off from the Trollope’s Pallisers, two works much in evidence in Season One. The series had the same strengths: again depth of feeling, gravity of approach (respectful of each of the characters), exquisite attention to historical detail, fine acting, and above all, the serial nature — all the soap opera characteristics — of the experience itself. The above still tells it all: if we had not experienced two years of Sybil’s life and the very painful courtship and marriage to the Grantham Irish chauffeur, the vulnerable poignant feeling of Sybil and the exacerbated hurt pride of Tom would not make any sense. The gap in a year matching a gap in our life’s experience deepens the analogous effect of time passing. The series also shows Fellows’s peculiar aptitude for finding just the right typical sociological behavior to make its themes manifest. For example, this part includes the exposure of a cruel trick by the upper class young man who had expected he might marry Sybil. He puts a drug of some sort into Tom Bransom’s drink, causing Tom to lose his inhibitions, over-react and literally become sick (near vomiting). This sort of thing did happen in upper class households and is regularly found in 18th century novels presented as a joke (in Smollett), and is still used to ridicule some socially unacceptable people in Powell’s Dance to the Music of Time. Fellows is too knowing a writer not to know this and when he has Edith’s lover, Sir Anthony Strallan (Robert Bathurst) a much older and (too) emasculated man, Fellows scores points in ethics. Many of the people at the table do not respect Strallan sufficiently because he’s not macho, and yet it is he who exposes the lout (for that’s what this guy really is). Breaks the taboo or code for allowing cruelty. 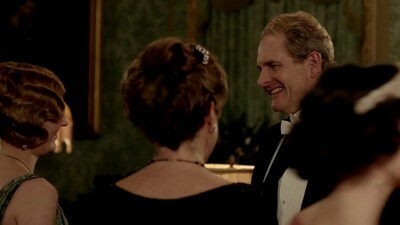 This allows the family to understand this is not Tom’s behavior and allows Matthew immediately to condemn the man, and later ask Tom to be his best man, Sybil to lead Tom from the table, and prompts the man’s father to apologize. It can be seen as part of this changing world caught in the often uneasy atmosphere of the hour. 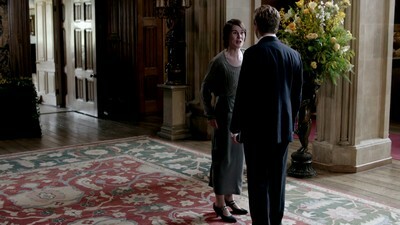 Against this (only slightly) while Fellows again presents Edith (Laura Carmichael) very sympathetically (deleted scenes in the first season showed her her father’s favorite) , he feels it necessary to have her mother apologize for her to Lady Mary because Edith is unconsciously tactless at some point. This kind of sop to the audience prejudiced against the earnest girl (the reading girl as we saw in WW1 segments) detracts from this portrait of this emerging pair of not-absolutely-conventional lovers. 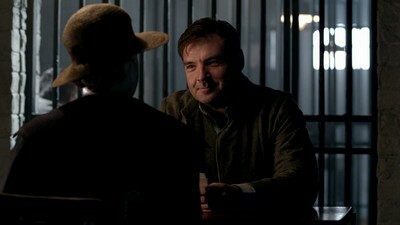 Coyle’s steady congenial yet hard-threatened face helps us accept all the improbability. In other words, the art, assumptions, characters are those I’ve analyzed before in blogs on individual parts of the first season (the luminous forest, crowded canvas) and one on its passionate dream quality and another its storytelling art. I’ve a stash of postings on the second season which if I ever get up the ambition I can put onto my website. They’re in the archives of Trollope19thCStudies and Women Writers through the Ages as Edwardian drama and a kind of art rightly associated with women (nothing to be ashamed of). One of the finest sessions I went to at the MLA was on film TV and seriality and featured a paper on Trollope’s Barchester Towers and connected Trollope’s art in his cyclical novels to the TV mini-series, Northern Exposure. Another was on Dennis Potter’s Singing Detective, which I now mean to rent from Netflix. I shall blog separately on this session and its papers soon.